The clear reflection produced when we walk in front of our bedroom mirror is quite different from the fleeting likeness we get as we walk past the windows of a downtown store. Even though windows and mirrors are made from glass, they serve different purposes. We can see in and out of a window, but we can't use it to watch ourselves as we shave or put on make-up. The glass used in a window and a mirror are similar, but other factors determine whether you can see your refection in them. Mirrors and windows are made from similar types of glass, but manufactured differently. There are several different types of glass and most of them are used for windows. Mirrors are usually made with standard flat glass sheets, sometimes called float glass, but this can also be used to make windows. Laminated glass consists of two or three layers of glass bound with resin or Polyvinyl Butyral. If the glass is broken, the resin keeps it in place. Wired glass has wire mesh in the center of the glass. This holds the glass together and is used mostly for windows in industrial buildings. Safety glass is treated by heating it til it softens. When broken, this glass produces tiny pieces without jagged edges. Basement or first-floor windows are often made with safety glass. Common reflective mirrors have a flat surface. They are used at home, in stores and in other places to aid people during personal grooming or as a decoration. The smooth glass in these mirrors reflects light from an object back to the object at the same angle without disturbing the image. This process is called specular reflection. An image seen in a plane mirror is the same size as the original object, i.e., a virtual image. Household mirrors are manufactured commercially using the silvering method. In this process, the back side of a sheet of float glass (usually 4 to 6 millimeters thick) is coated with aluminum or silver. This metal coating creates the reflection. It also prevents damage to the opposite (plate glass) side of the mirror. In industrial manufacturing, aluminum or another metal is heated to a boil in a chamber. A glass sheet is then placed into the chamber, where atoms from the metal then cool and attach to it. Most mirrors are back-silvered, containing silver that's visible through the glass. 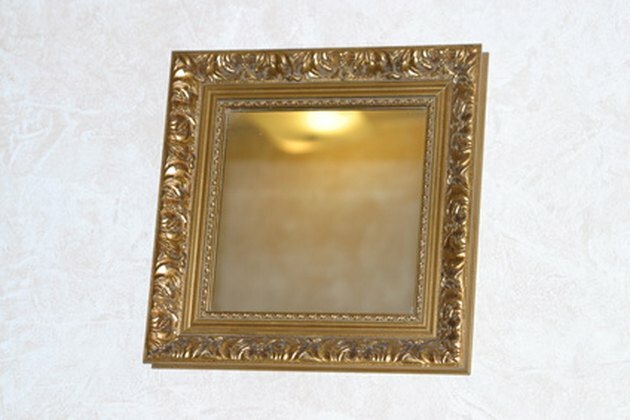 A front-silvered mirror has a reflecting service on top facing the image. Ancient and antique mirrors were fashioned out of obsidian, bronze or tin polished until the surfaces reflected light. The reflections we see in modern mirror glass is caused not by the glass itself, but by the silvering process that's used to produce this effect. Bathroom mirrors and decorative silkscreen printed mirrors are produced using variations on this silvering method. The glass used to make some windows is treated for safety reasons to lessen breakage or for decorative reasons (stained or colored glass). What Is Venetian Scavo Glass?